Graduating seniors Audrey Michelle Ward, Rachel Katharine Cason and Kendall Brooke McPheeters received Samford University’s top senior awards during graduation exercises at the school Saturday, May 16. Ward received the President’s Cup—the valedictorian award--for having the highest grade point average across all university schools. 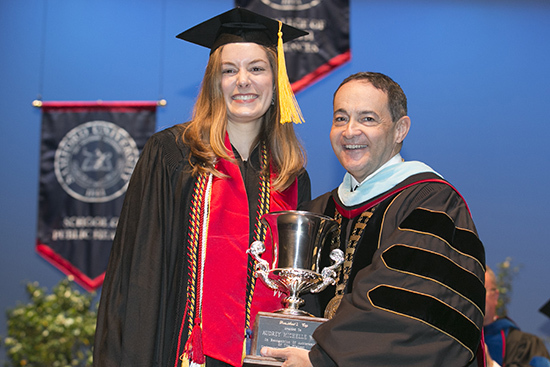 She received the trophy from Samford President Andrew Westmoreland during the graduation ceremony for Samford’s Howard College of Arts and Sciences. She is an English major from Hendersonville, North Carolina. Cason received the Velma Wright Irons Award—the salutatorian award—for having the second highest academic average across all university schools. She received a silver tray from President Westmoreland at the graduation ceremony for Samford’s Orlean Bullard Beeson School of Education and School of the Arts. She is an education major from Opelika, Alabama. McPheeters received the John C. Pittman Spirit award as the graduating senior who has exhibited exceptional Christian character, commitment to academics and community spirit. A biology major from Owens Cross Roads, Alabama, she received her award at the Howard College of Arts and Sciences ceremony. The Pittman award was established in 2004 to honor the longtime Birmingham insurance executives’ 50th anniversary as a member of the Samford board of Trustees. The 1944 Samford graduate, who served 62 years as a trustee, died in April at age 92. His son, David Pittman, daughter, Carol Mitchell, and nephew, W. Randall Pittman, Samford vice president for advancement, presented this year’s award to McPheeters.